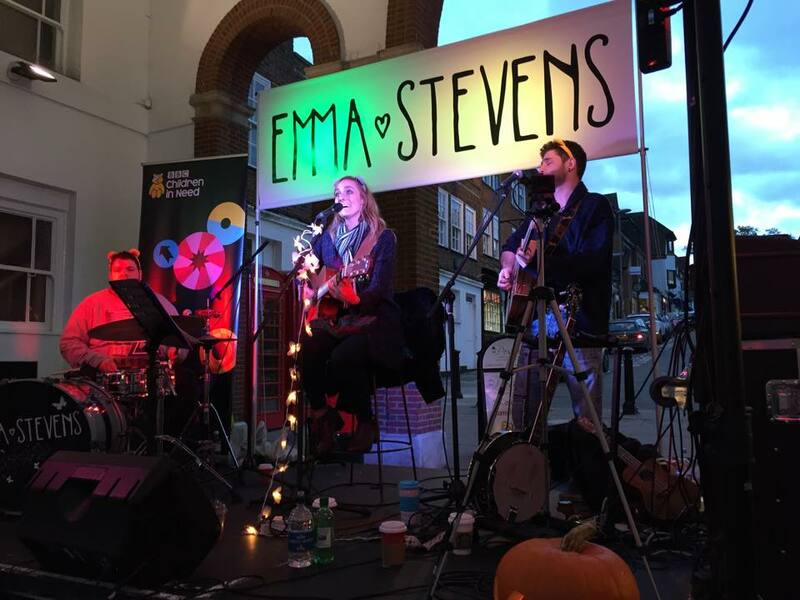 12 Hour Buskathon for Children in Need – I did it!! For those of you just reading this wondering what on earth I’ve been up to, wow… Where do I even begin? 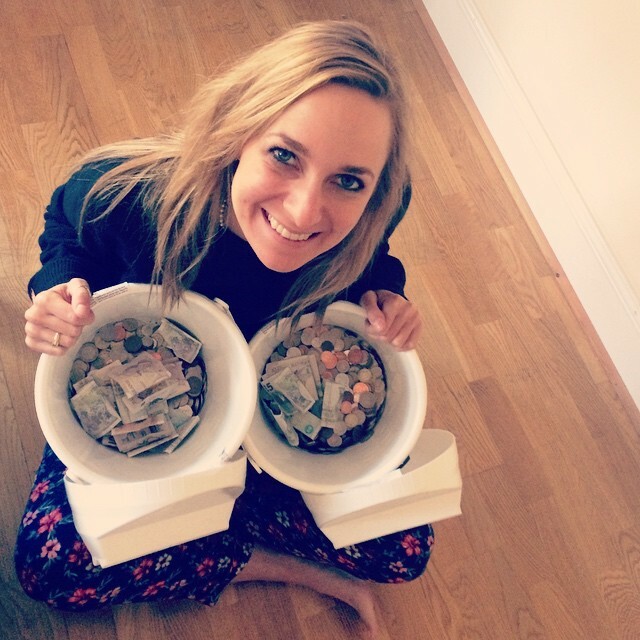 Recently I’ve been wracking my brain to think of a way to raise some money for charity. After much deliberation, I decided to orchestrate a 12 hour “buskathon” to raise money for a charity I’ve always felt very passionately about; Children in Need. I played continuously (bar a couple of wee stops!) for 12 hours! An epic undertaking, but it all went pretty quickly mainly thanks to all the incredible support I had on the day. I really want to say a hugeeeeee THANK YOU to everyone who came along and put money in the buckets, cheered, clapped, danced and wore glorious smiles! Along with music, I also encouraged people to come and “donate to paint”. 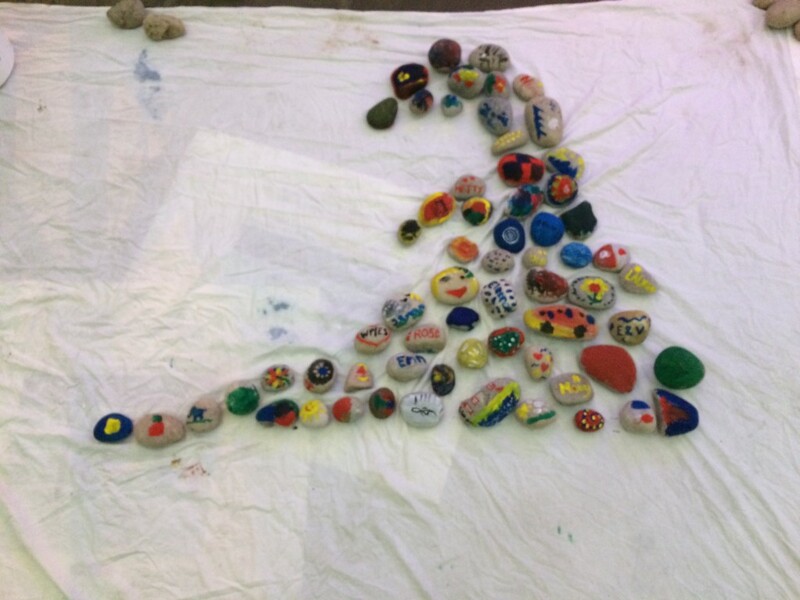 The idea was that people would pay a pound and paint a pebble, which would decorate the area in front of the stage, creating a “wave of love” combining music and art. I felt this was especially appropriate, as my new album is called “Waves”. It was great to watch the painters (both big and small!) whilst I was on stage performing, and it certainly made the time go faster. Thanks to all those who did! At the 9 hour mark, my whole body was aching from so much continuous playing (today I’ve had a heat pad permanently on my neck! ), so for the first time I was forced to sing a few of my songs without playing – a most unusual experience for me, as you all know I’m usually permanently bound to my ukulele or guitar! I couldn’t have done this without the constant help of Marco Frankland, Sam Whiting and James Rees who were on hand for almost the entire day! I’m so grateful to them for being there! 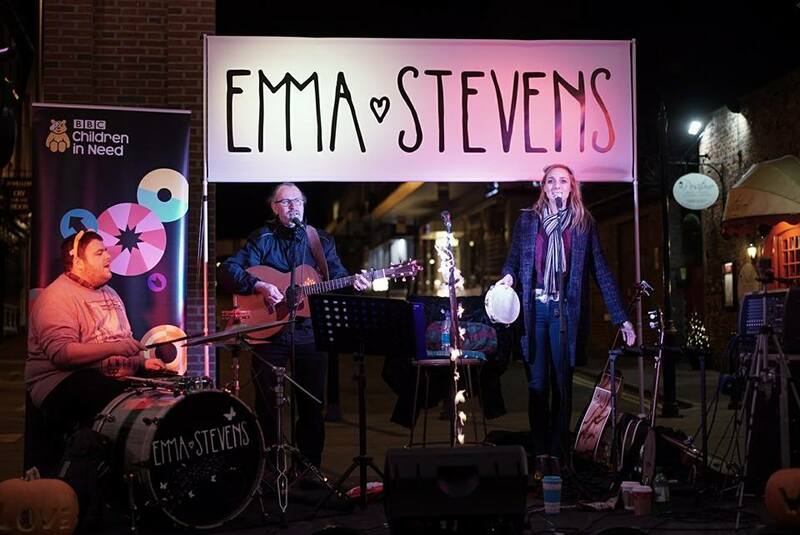 Blue Dot Display, Godalming for making me a HUGE Emma Stevens banner! Guildford Council for allowing me to use the High Street to busk and making it really easy for me to get the licences and other various bits I needed. Continental Cafe in Tunsgate for the surprise tea and coffee! Marco Frankland (without whom we wouldn’t have had a stage! ), Brian Cadge (videographer), Graham Peacock, Kathy Anderson and Mark Smutz Smith (huge thanks to his other half Athena too for supplying pebbles etc!) for being there with me from the very beginning until the end. My band mates James Rees Flynn and Sam Whiting, who arrived at 10:30. I thought they’d stick around for an hour or so but they ended up playing with me the WHOLE DAY. That made me really emotional and I am blown away by their support. All the people who came up and shared their musical talents – Sam Rommer, James Hepworth, Marco Frankland, Freya, Otis, Jon Gathercole, Kate Issacson, Duncan ‘Dunx’ Byiers, Chris Nugent (White Pigeon), Spud Smith, Emma O’Gorman, Jess Hills, James Welch , Patsy (tambourine) – I know there were more, and I apologise to those that I’ve missed! Thanks to Sam Rommer for helping me count this fantastic sum of donations!!! WOW!!! I can’t believe this all started from just an idea in my head! It just goes to show that you can do anything if you put your mind to it!